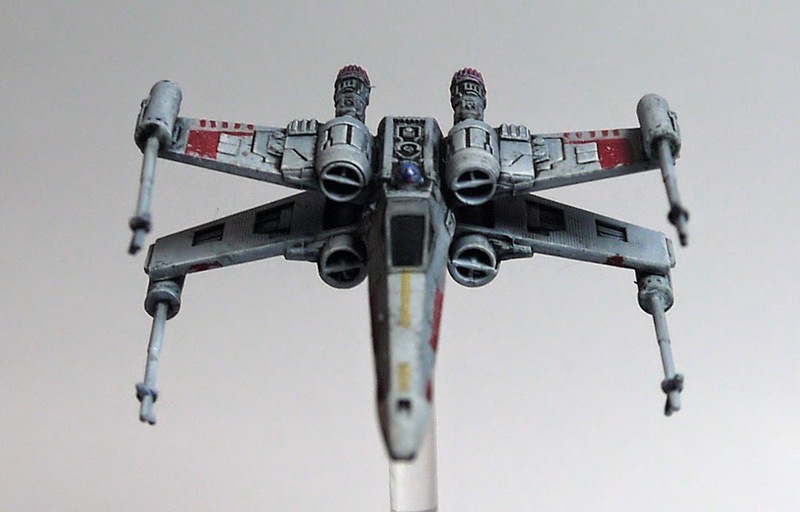 Arguably the most well known science fiction star fighter of all time, Red 5 was the personal fighter of Luke Skywalker during the battle of Yavin. He used it to destroy the Death Star and save the Rebellion. The craft is represented here before trench run, with R2D2 still operational. If you're interested, 2 WIP shots of the model follow. First the model after application of the base colors on black primer. 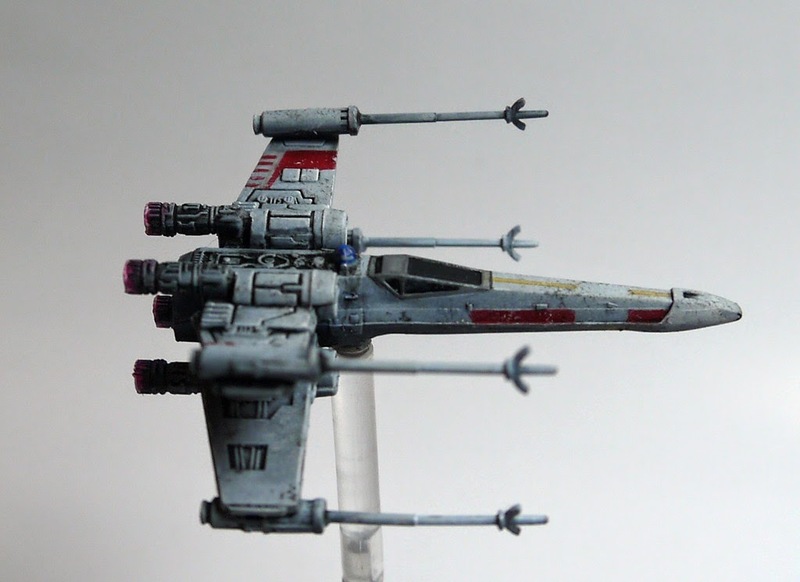 As on the B-Wing, I first airbrush white for the base color, then painted the markings in mephiston red. The yellow nose line was painted in Iyanden darksun and highlighted with Iyanden+white. 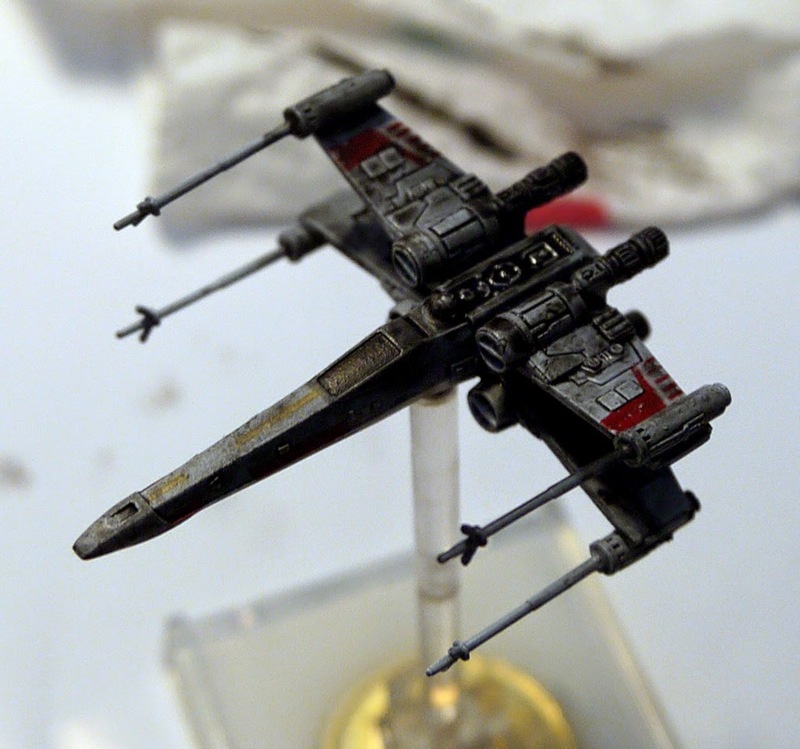 The cockpit was painted in astronomican grey+black and the canopy received a simple coat of black. 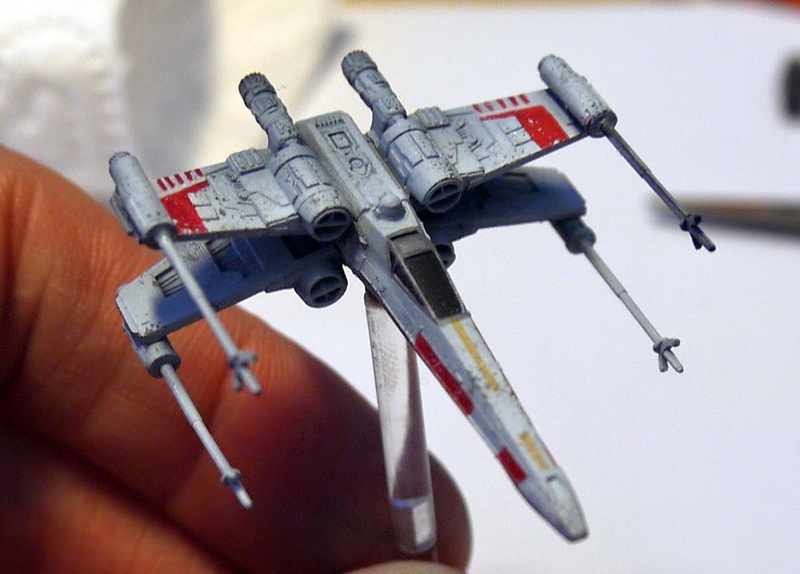 To get closer to the banged up look of the fighter in the movies, I then painted small grey dots using a small piece of foam to get random patterns and give the weathered look. After that followed the now classic black oil wash. The wash was removed on the raised/flat areas using a qtip, then I highlighted the grey base with white and I finished the details. 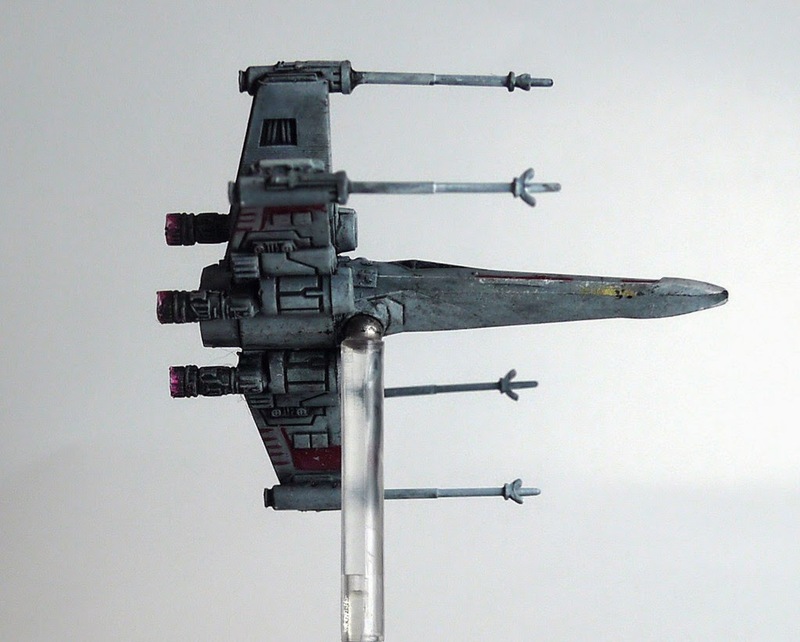 After reading the bomber thread on the fantasy flight games forums, I wanted to try the Tie bomber. I'm a fighter swarm man myself, so I tried to cram as many ships I could into 100pts. Here's what I got : 5 gamma squadron with seismic charges, 100 pts. My reasoning was : more ships, more firepower, more ordnance at the impact point on the important turn. After that, higher PS means you can see where is your opponent before unleashing said ordnance. Guess what: no plan survives first contact with the enemy! We both slow played the first turn, with hostilities starting on turn 2. He focused with all 3 ships, while I target locked the middle Bounty Hunter. I made a mistake here, I should have banked and concentrated on the shuttle, because as you can see position was ideal for him: the 2 bounties have room for a 1 straight next turn, and I won't be able to use my seismic charges. I locked instead of focusing because I knew I would be able to use the lock the following turn after K-Turning. He did 3 damages to the top bomber : 2 crits (1 with vader), console fire and thrust control fire, while I removed 3 shields from the middle hunter, keeping 3 locks on him. At this point, the situation was difficult for both sides. We had the same number of hull+shield on both sides (30) at the beginning of the game, but due to the way Vador works, he actually lost 11 points to my 8. However, I was down one ship, and my firepower was thus 20% lower. Disaster! I went too slow, letting the hunter increase the distance to range 2, meaning that I failed to destroy the top hunter, leaving him with 1 hull (choose focus as my actions, failed to roll any eyes). 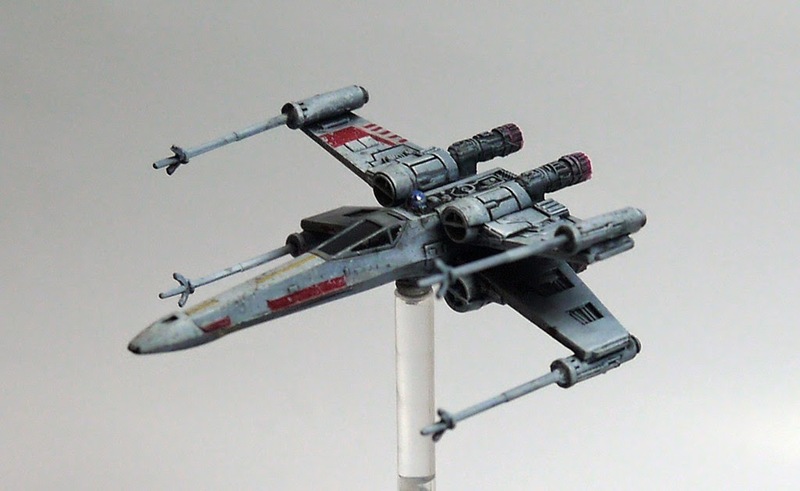 The hunters on the other hand finished the damaged bomber, leaving the lambda free to crit the lead bomber, taking two damages for Vador : damaged cockpit (twice) and injured pilot . It was looking pretty grim for Gamma squadron! He banked 3 the top hunter and hard turned 2 the other, the lambda banked one. On my side, the damaged bomber did 1 straight at PS0 to get an action, while the 2 others leap-frogged it, all three dropped charges on the lambda. In a stroke of luck, the first bomber took the last hull from the top hunter. While the lambda did its thing, leaving itself and the damaged bomber with 1 hull. I K-turned the 2 bottom bombers to finish the lambda before it got to fire another force powered shot while the top bomber trailed the hunter. The rest of the game is less interesting, suffice to say I tried to preserve the damaged bomber from the hunter, failed, and lost another bomber to get the firespray down to one hull. At some point we entered a turning duel, and I tried to match his radius, taking a 2 hard turn. I had a 3 dices shot, with no action, to his 2 green dices and evade token for his last hull. 3 Blanks! We had to call the game as I had to leave : Victory for Vader, with 80pts destroyed to my 62 pts. Even if I ultimatly lost, the bomber is definitely an interesting ship to play, much more resilient than my usual Tie-Fighter, and with lots of ordnance options. Now I want to try missiles and torps! 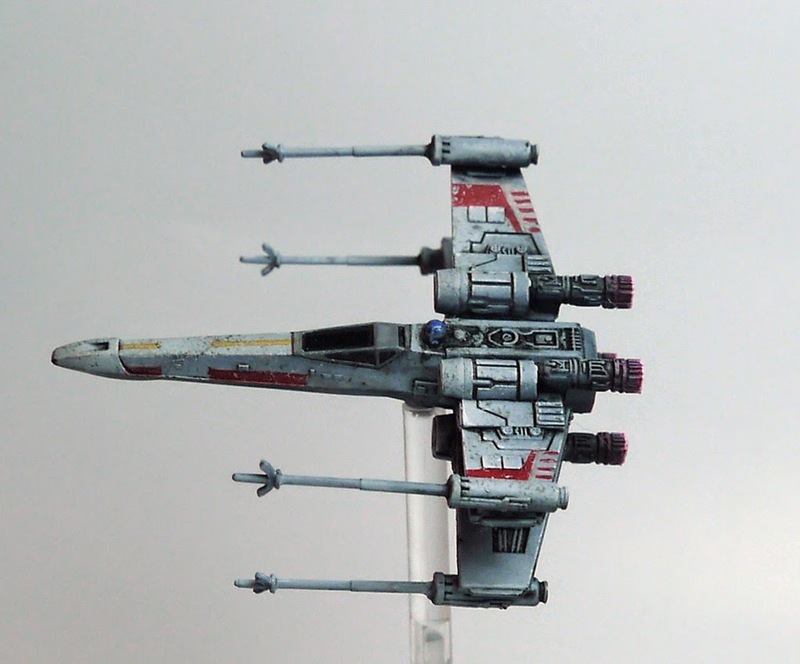 Do you feel that asteroids in X-Wing are too two dimensional? 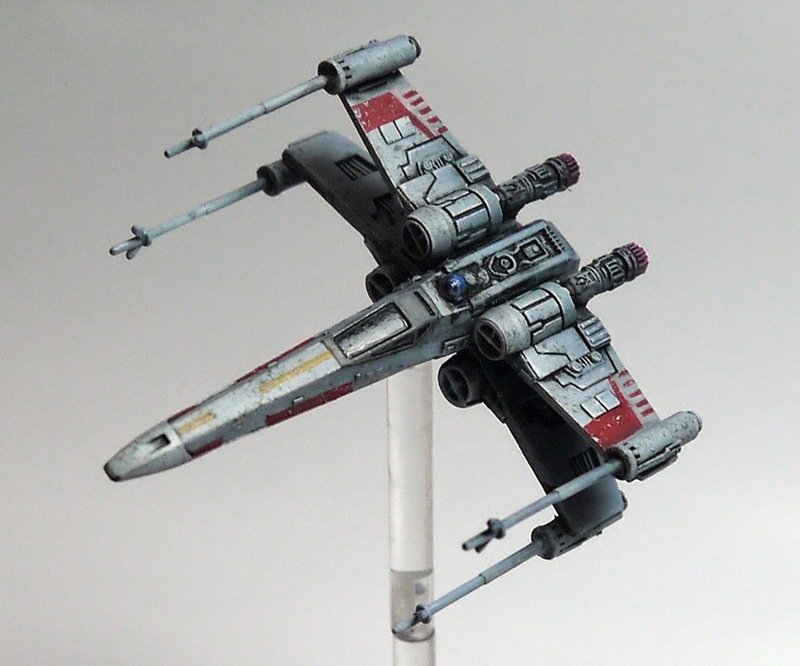 Do you keep K-Turning X-Wings on asteroids? Attack of the Sponge Asteroids! The asteroids had to be playable in a tournament, thus the shapes had to be the official shapes, the rocks had to be removable to place models on top of the asteroids and finally either faces had to be usable. First start by drilling a 5mm hole in the center of all cardboard asteroids and glue a magnet inside. Then drill a 3mm hole in your coins and glue a length of rod on one side. I went with various lengths between 4 and 6 cm to increase the visual impact. I said coat everything! We're going to need that undercoat for the next step. Take out the airbrush, load with thinned white and spray the asteroids randomly. Now you can either stop here, with pretty nice asteroids on black bases, or, once more inspired by Rodent Master, you can go the extra mile. To achieve the radar display look, paint in white a couple of concentric circles by rotating the the base around the magnet. Then paint the 8 intersecting lines. Go back with a black brush to correct your mistakes. Afterthought picture using a finished base to reproduce the masking pattern. Spray white paint starting at the mask and fading going counter-clockwise, so that the white is brighter close to the mask and fades to the black undercoat on the opposite side. Finish by tinting the grey/white of the asteroids with your ink of choice. Now I can finally play Alderaan as it should be played! 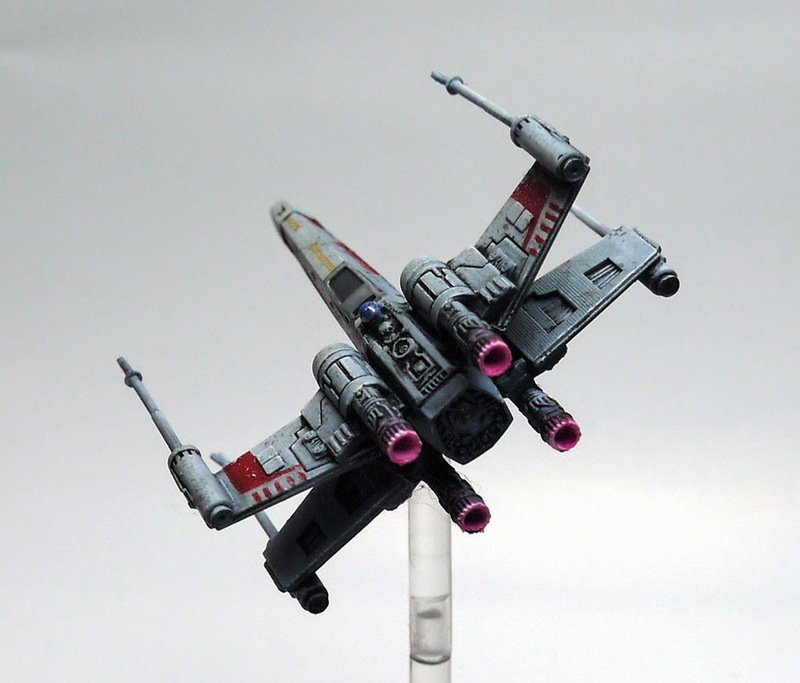 "Unidentified Firespray, this is Mauler of Black squadron, reduce speed for visual inspection"